I started with scripture today because I believe that Biblical scripture is without error or fault. Scripture tells me that God gives wisdom, knowledge, guidance and understanding. Scripture tells me that we walk by faith and that God will supply to us whatever it is that we need. In effect scripture tells me that whatever it is that life is for me at this very moment, I can let go of. 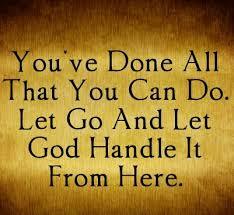 I can let go of the stress it is causing me because I can be assured that God will fill my every need. The point is, If indeed I believe that scripture is without error and is God breathed and if I believe that Scripture tells me that God will supply my every need, I need to make the choice whether to walk in faith and live with the certainty that God will do what He says He will or whether to live in a state of constant chaos and worry. Satan knows these scripture and he knows this is fact but yet that little red devil will do his best to make you doubt it. He succeeds a lot of the time seeds are doubt are powerful things. He uses the uncertainty of life to plant doubts and then he uses those doubts as footholds to get a grip in our lives. 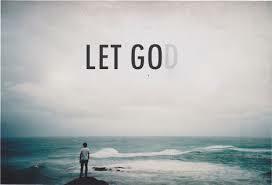 Sometimes, as now for me, letting God do what He wants in our lives means making changes. When God is offering you a solution to your problem and you know it with a certainty that only God can provide, but you resist……….. most likely that is a choice you are making based on earthly reasoning. If you are hesitating because it may mean being uncomfortable, or it may ruffle feathers or the going may mean rough waters for a time………..that is a choice you are making based on earthly reasoning. Note to self…………….if all the above is true AND you also know that if you listen to God the end result will most likely be successful, but yet you won’t let go and let God……………that is definitely based on earthly reasoning. The first step to having our needs met by God is to trust Him totally and completely with every decision. I think I will start there. I heard those words in a song this morning at the rec center and I have not been able to get them out of my mind since. Bear with me as I try to get onto paper what God has been weaving through my heart all day long. The exact path is still a bit fuzzy to me so let’s see where this goes. 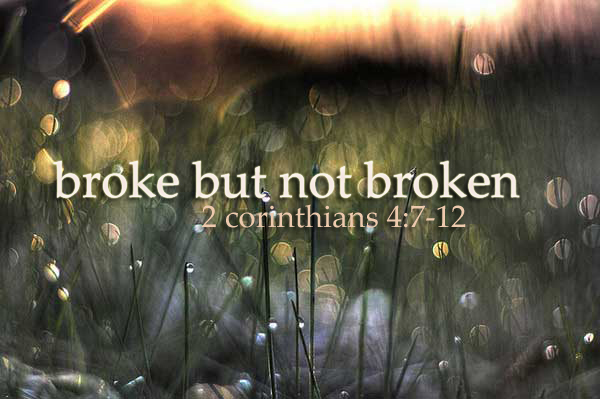 Broke but not broken ran around in my head all day long and I just couldn’t grasp what God was trying to tell me. Most of you know that the past 9 months or so have probably been some of the hardest times I have ever lived through. The pain was intense and searing hot, the loss as heartbreaking as a death and the void it left felt like the Grand Canyon times a million. I am not going to recount events because most of you know anyway. I guess specifics aren’t really important to this story. Events that bring you to your knees tend to be of the devastating nature and often leave you feeling broke but not broken or vise versa. I most certainly felt broke and was only feeling that they had not “broken” me because of an earthly stubborn streak that simply wouldn’t let me give in. To give in was to lose, or let the other team win and dang it, that was not going to happen! Then late this afternoon events broke that meant the ordeal was finally over and the results could have only happened with the hand of God. It literally hit me like a ton of bricks. Suddenly I knew beyond a shadow of a doubt what God was trying to tell me. Maybe this whole story wasn’t about who won or who lost. Maybe just maybe walking through this story was the only way to get me to see that sometimes God needs us to get in a place where we are broke AND broken. Then and only then do we let go of that earthly stubborn streak that has held us back from enjoying true freedom in Christ. Well it certainly didn’t take long to get to the heart of what God was laying on my heart. To write it was easy, short, sweet and to the point. To live it took many long heartbreaking months. But I get it now. God you truly are amazing. No matter how hard the road is you are taking me down, I do know without a doubt that you will meet me at the end of that road. I am hearing that it will be motorcycle riding temperatures the next couple of days. Those of us who ride spend the winter counting the days until spring. We wait impatiently for a day or two of warmer temps so we can break the monotony of winter and fire up the bikes and ride. We usually put the “Winter Wait” to good use, we plan our summer riding schedule, we work on our bikes if there are repairs that need to be done, pour through catalogs our browse our favorite motorcycle showroom looking for motorcycle accessories. We generally get our plans and bikes in shape and ready to roll as soon as spring rolls in. I wonder do we take the same interest in seeing that the time spent on earth waiting for our Heavenly Father is a productive time. We know that time is short here on earth and there is no time to spare, but how seriously do we take that? Time is so precious that God gave it to us in one second increments. How many of those seconds, minutes, hours, days, months and years do we waste while piddling around here in our earthly home? Do we really take seriously the urgency facing us? We can recoup a lot of things in our lives, with enough money and work we can usually replace almost any material possession we need to. That is not true with time that we should have been spending cementing our eternal home. When that time is gone…………………….it’s gone. I don’t think that God put us here on earth to waste time, I believe He put us here to prepare for eternity and to help others find the way too. I don’t know about you but when I finally meet Jesus I don’t want to be standing in His presence and have to admit that I found almost everything in my life more important than Him. I don’t want to admit that I was too busy wasting time to prepare to meet my King. I am not sure how long I have left on this earth, none of us are. I don’t believe we have time to waste. I do think I have a solution however, if you love to ride…………. you love to ride and you are probably not going to stop. I think one way that I shall prepare for eternity is by riding for Jesus. In all that I do I hope to bring glory to my Father that includes riding my motorcycle. 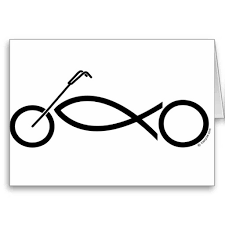 So excuse me while I go work on my bike……..I have eternity to prepare for!